Completed in 2017, the Adana Integrated Health Campus is a state-of-the-art hospital complex in Turkey comprising three specialised clinics with a total capacity of 1550 beds. Located in Adana – the country’s fifth-largest city – the over 318 000 square-metre facility is a public-private partnership project realised in cooperation with the Ministry of Health to serve patient populations from the surrounding Adana, Hatay and Osmaniye provinces. The Adana Integrated Health Campus prides itself in offering the highest level of care through specialised physicians and advanced equipment. The Main Hospital offers an Oncology Hospital as well as a Cardiology and Cardiovascular Hospital at a 367-bed capacity. The Maternity & Pediatrics Hospital has 349 beds and the General Hospital 584 beds. Before opening to the public, the project won several awards, including Best Healthcare Project and World’s Largest Seismic Isolated Health Campus. 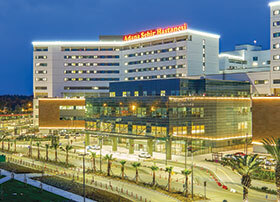 When it came to choosing a security and safety solution for their high-profile health facility, officials in Adana wanted to integrate the most advanced hardware on a single platform covering four areas: video surveillance, access control, fire alarm plus public address and voice alarm. Bosch won the contract as the one-stop provider with the capacity to unify all systems via its Building Integration System (BIS) through different interfaces. The installation was completed by the Bosch partner Ateksis. Due to the size and complexity of the modern campus, this level of integration proved a true test for the Bosch Building Integration System (BIS): The IP-based video surveillance system consists of 2000 cameras for monitoring critical indoor and outdoor areas such as entrances and corridors. Managed on the Bosch Video Management System (BVMS), live feeds from high-definition Flexidome, Dinion IP starlight, and Autodome IP starlight cameras are monitored on-site through a single control room. Providing fire safety, BIS controls roughly 45 000 detection points, including 30 000 fire detectors, plus manual call points and interface modules across the campus. For an extra level of integration, the hospital’s telephone switchboard is integrated into the public address and voice alarm system via BIS to enable public announcement and/or fire alarms from the nurse desks for immediate evacuation of patients and their relatives. And to safeguard the Maternity Clinic against ‘Code Pink’ cases (baby kidnapping), the Bosch access control integrates RFID tags on newborn babies to trigger alarms. By implementing a complete solution on a single platform from the start, Adana Integrated Health Campus sets the standard for exemplary patient safety in a system marked by low overall cost of ownership, maintenance costs, and failure rate. In the bigger picture, the state-of-the-art campus proves the end-to-end capabilities of Bosch Building Technologies and serves as a showcase for the next level of healthcare and integrated security.